This home at 597 W Co Rd 600 N in Orleans is a 1999 28' x 76' 2,458 square foot manufactured home with a double attached garage. Lots and lots of room in this 3 Bedroom / 3 Bathroom home. The garage can be used for your vehicles on one side and a very large storage area on the other or with a little adjustment you can have a 40' x 28' attached garage. There is a 10' x 33' air conditioned enclosed front porch, a 10' x 43' open covered porch, and in the back a 12'x 28' covered porch. A chain linked fence surrounds the above ground circular pool and deck. There is a pet door for your pets to exit the home to the large fenced back yard. There is a corner built in desk off the kitchen and a gas fireplace in the family room. The master bedroom is 12' x 26' with double bathrooms and double walk through closets. Central Air with gas furnace and range, roof and siding was installed in 2015 and the pool liner was new in 2015. 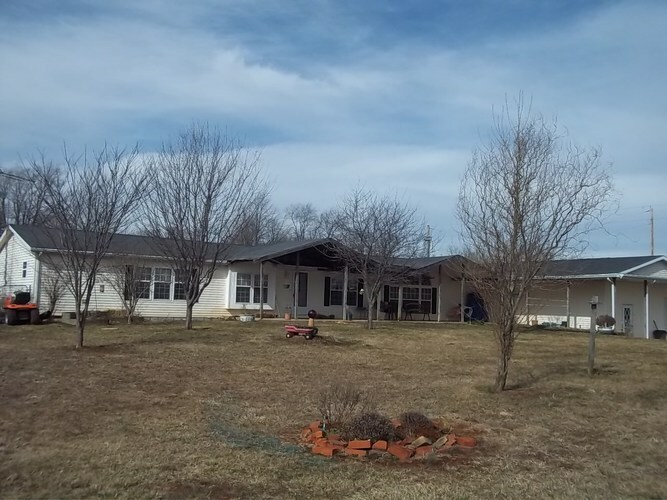 Lots of shade surrounding the open porch, large gravel driveway, and a large level front yard all for $149,000. Directions:Traveling North into Orleans on 37 N, turn left onto Jacobs Road which is County Road 600 N. This road is in the curve just before you get to the Wesleyan Church Camp Grounds. The home is approximately 1/2 mile on the left side of the road. Listing provided courtesy of Brooks Galloway Real Estate.